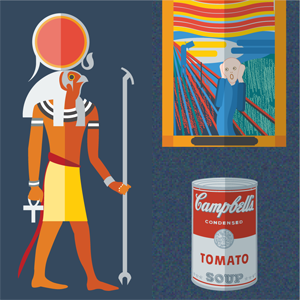 This Introduction to Art History Course uses problem­-based learning that shows you how to apply your knowledge in real­-world situations. Our ManyWays™ learning model feature multiple teachers and various instructionalstyles for each concept so you can find a style that meshes with yourindividual learning preference. This rich, immersive experience helps youbetter understand and retain information, for an all­-around smarter way tolearn. Sophia's Introduction to Art History Course helps you gain mastery of thebasic art history elements of the Western world from prehistoric to moderntimes. In this Course, you will explore art exhibits, analyze buildings andarchitecture, and examine art in everyday life. Interpret Art from 1901 AD through Present. I just finished this class, and while the content, instructors and provider were all top notch, I do have one bit of warning; This is a lot of information to go through, and if you are like me with no interest in the subject, it is challenging to complete in the time allotted. The content was very well done, but each challenge and milestone (18 challenges and 7 milestones) took hours to complete. While I take all online classes, this was a tough one to get through.